The 49ers defense has been the foundation for the team’s turnaround season. With mobile, fast linebackers in Patrick Willis and NaVorro Bowman, and pass rushers such as Justin Smith and rookie Aldon Smith, plus a rebuilt secondary, San Francisco has consistently shut down opposing running games and led the team to a 10-2 record and the NFC West championship. Yet a hamstring injury to Willis Sunday in the team’s 26-0 victory over the St. Louis Rams cast a bit of a shadow over the team. Bowman leads the team in tackles with 121, with Willis second at 115. Willis injured his right hamstring on a first-quarter play Sunday, left the game and did not return. 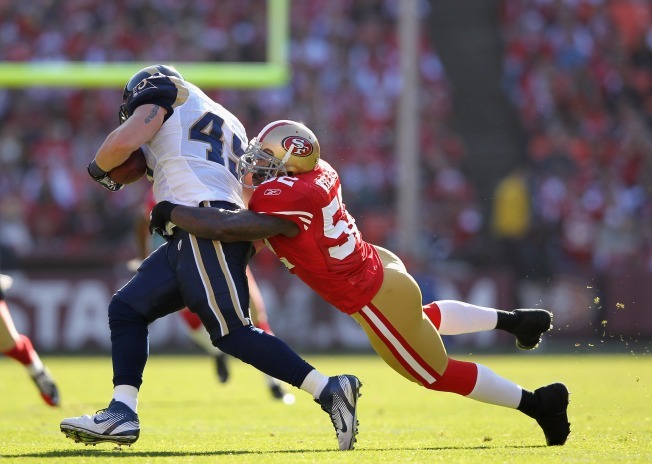 The Niners are hoping Willis incurred a mild hamstring strain and will be ready to return soon. After the game Sunday, coach Jim Harbaugh said the team will monitor Willis over the next couple of days. Willis also is scheduled to undergo an MRI exam on the hamstring Monday. Larry Grant, who replaced Willis at linebacker Sunday, told Matt Maiocco of CSNBayArea.com that it doesn’t appear that Willis’ injury is serious. Since Willis was the 49ers first-round pick in 2007, the inside linebacker from Mississippi has been outstanding. He’s a four-time Pro Bowl pick, was the AP Defensive Rookie of the Year in 2007 and is a three-time AP All-Pro selection. Willis is thought by many to be the best inside linebacker in the NFL, and was ranked No. 1 by his peers in a USA Today story this year. And a guy the 49ers can’t afford to lose.